My clients often ask me for recipes without any form of gluten or starch. We have an abundance of good tomatoes in stock now and large ones can make a complete meal in themselves. 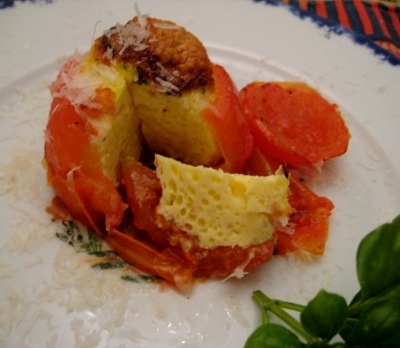 I decided that I would make a light, summer supper using ripe tomatoes, fresh basil leaves and some delicious Cantal cheese. This cheese comes from the Massif Central, Auvergne, in the heart of the France. I receive it in a 10kg wedge. The crust is light brown and the centre is a lovely golden colour with a slight crumbly texture. The Cantal that I stock in the shop is the Entre-Deux, which has been aged for 6 months. 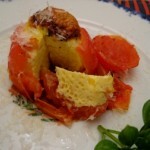 For my recipe I used beaten egg to make the stuffing and blended in the Cantal and basil. It’s a really simple, tasty dish and satisfies one’s hunger and is easy to digest. I will admit to making some croutons to accompany it but this is of course optional. I decided to serve this dish with a wine from the Auvergne, the same region as Cantal, a Puy de Dome Pinot Noir from Cave Saint Verny. The Massif Central is an old volcanic region and the Pinot Noir enjoys the high altitude. This Pinot Noir is smooth; it has a lovely taste and a dark purple colour. Carefdully remove the inside seeds and central flesh so that the tomatio is hollow. Place cut side down on some kitchen paper towel and drain for about 15 minutes to get rid of extra liquid. Break the eggs into the bowl of a kitchen blender, add the basil and grated Cantal, salt and pepper and blend well together for a few minutes. Place the tomatoes on a plate and put a baked cap over the top of each tomato. Decorate plate with some fresh basil leaves and sprinkle with some grated parmigiano and grated black pepper.